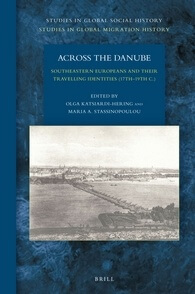 The Danube has been a border and a bridge for migrants and goods since antiquity. Between the 17th and the 19th centuries, commercial networks were formed between the Ottoman Empire and Central and Eastern Europe creating diaspora communities. This gradually led to economic and cultural transfers connecting the Mediterranean, the Black Sea, and the Continental world of commerce. The contributors to the present volume offer different perspectives on commerce and entrepreneurship based on the interregional treaties of global significance, on cultural and ecclesiastical relations, population policy and demographical aspects. Questions of identity, family, and memory are in the centre of several chapters as they interact with the topographic and socio-anthropological territoriality of all the regions involved. Contributors are: Constantin Ardeleanu, Iannis Carras, Lidia Cotovanu, Lyubomir Georgiev, Olga Katsiardi-Hering, Dimitrios Kontogeorgis, Nenad Makuljević, Ikaros Mantouvalos, Anna Ransmayr, Vaso Seirinidou, Maria A. Stassinopoulou.